The HiddenRadio began life as a Kickstarter project that quickly gained a slew of supporters thanks to the speaker's innovative design: The round unit has a buttonless exterior; you twist the outside of the shell clockwise to raise both the speaker and the volume, and you twist it counterclockwise to lower the speaker and turn the volume back down again. Based on its Kickstarter pitch, I had high hopes for the HiddenRadio, but I found it rather underwhelming in person. The speaker is 3.4 inches in diameter and 3.8 inches tall when collapsed (4.9 inches when “open” all the way), and it weighs just under a pound—it’s easily portable. 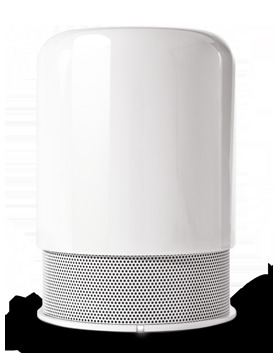 The HiddenRadio comes in three colors: Metallic Silver or Graphite Black for $190 each, or a Pure White Edition for $220. I tested the silver model. As I mentioned, there are no buttons visible on the exterior of the HiddenRadio, though a small LED on the base reflects charging status, Bluetooth-pairing mode, and other states. Flip the HiddenRadio upside-down, and you reveal a few tiny controls. There’s a source-mode slider—which I found usable, though a bit frustrating because of its tiny size—with three positions: Bluetooth, auxiliary, and FM radio. Beneath that slider are two very small tuner buttons for the FM radio. Also on the base are two recessed ports: a Micro-USB port (for charging the speaker) and a 3.5mm (1/8 inch) auxiliary input jack, with the latter also serving as the connection for the included FM antenna. In addition to that antenna, the speaker ships with a USB-to-Micro-USB cable and a 3.5mm audio cable. Plugging a cable into one of these deeply recessed ports, particularly the Micro-USB port, is a hassle. To charge the HiddenRadio, you can plug the USB cable into either your computer or a standalone USB charger like the one that shipped with your iPhone. The company says you should expect 15 hours of continuous playback time on a full charge. That meshed with my experience—I didn’t see the low-battery LED warning until I crossed the 14 hour-mark. Once you plug in the FM antenna, the HiddenRadio loses some of its cable-free charm on account of the white wire sticking out of it. And you’re not going to want to tune and retune the radio very often: The controls are on the underside of the unit and difficult to use; more frustrating, there’s no display indicating which station you’re on—you’ll want to find a favorite station by trial and error and then stay there. The hallmark of the HiddenRadio is, as I noted, that the speaker itself is the volume knob: Twist the HiddenRadio’s body clockwise, and the outer shell rises up—and the volume goes up with it. The problem, in my testing, was that although the Kickstarter video shows users twisting the speaker with one hand, I was unable to do so: Whether I placed the HiddenRadio atop wood, plastic, or granite surfaces, the base just wasn’t grippy enough to hold the base in place while I twisted. I ended up having to hold the base with the other hand, making one of the HiddenRadio’s big selling points an annoyance instead, as it took more effort to adjust its volume than if the system sported a traditional volume control. I also found the HiddenRadio’s audio quality somewhat disappointing. The company doesn’t talk specifics about the speaker’s innards, saying only that it uses a “proprietary 360-degree sound diffuser.” This means you could plop it in the middle of a circular patio table and ensure everyone’s hearing the same audio. But if you’re aiming to use the HiddenRadio for personal listening, or if it’s not positioned smack-dab in the center of all your listeners, it’s not the best approach, as much of the audio is projected away from you. The HiddenRadio is clever, portable, and cute. But at a price of $190 or $220, it’s not a great value. The aforementioned $200 Jawbone Jambox and the $100 Big Blue Live may not be quite as small, but they’re still easily portable and each provides sound that’s far more satisfying to my ears. But even if sound quality wasn’t an issue, the HiddenRadio’s frustrating ports and volume-dial mechanism keep me from endorsing it over its rivals.